Kind of chameleonic, but currently just another writing blog. Change and the common girl. I’m having a bit of a renaissance. When I was fourteen I went to an all-night screening of John Hughes films at the local ABC and, watching Pretty in Pink, I remember despising (strong word, but the right one) the subplot about Iona, the thirty-something record shop owner, and her pursuit of true love. Why is she even bothering, thought fourteen-year-old Lynsey? She’s so old, it’s too late, let’s see more of Steff (James Spader) leaning expensively on cars. That boy knew how to lean. I wasn’t a complete idiot, though. This was always my favourite scene, even then (although I probably, yes, definitely used to have a massive heart-swell when OMD played at the prom where Andie and Blane – yes, you are reading those names correctly – were reunited at last over some oddly-sliced pink silk and chiffon. PLOT SPOILER. Oops, sorry). Iona, the old-timer, is the disturbingly young looking creature in the pillbox hat. So, yes, I am now older than the old-timer Iona. Curiously, I have wound up giving that name to a character in The Novel That Dare Not Speak Its Name, so perhaps she had more of an influence on me than I realised. The thing about being over the hill is that you’ve climbed it already. So, first of all, you deserve a goddamn cup of tea, in a fancy flask. And a biscuit. Give your old feet a rub. Have a natter with your fellow climbers about watercolour painting and Areas of Outstanding Natural Beauty and admire a passing bird with royal blue plumage. And then, oh aged one, hoist those binoculars because there is lots still to see on the other side of the hill. And the going is, well, it’s less hilly. One might say it’s Norfolk. It tends towards flatness. 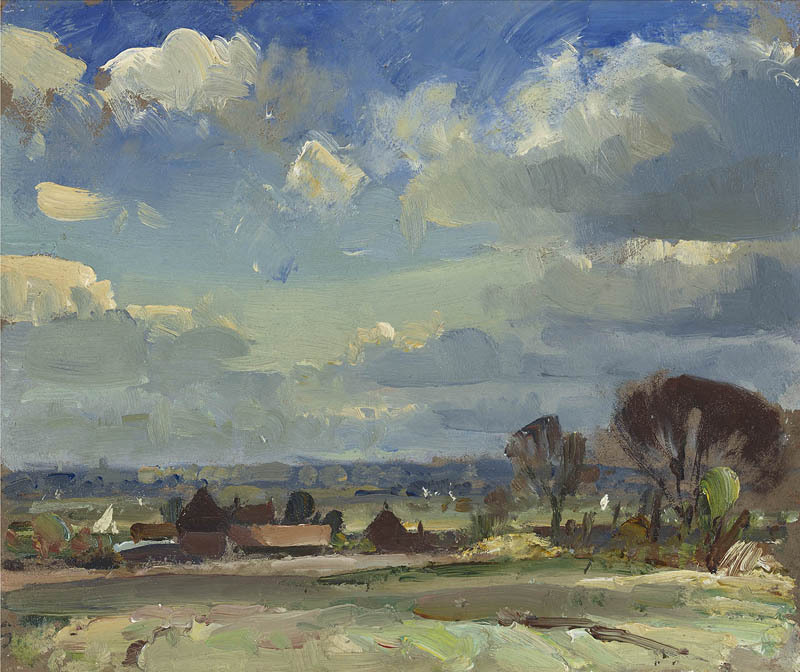 Edward Seago: ‘A Norfolk Landscape’. In hills, it is somewhat deficient. The thing is, you see, that until you’ve climbed the hill you can’t see over it. You can’t see what’s there. The young still milling about at the base of the hill, or a little way up it, can’t peek yet (or possibly peak) because ‘over the hill’ is a place you can only see once you get there. And it’s freaking awesome! This won’t be everyone’s experience, I know. And it wasn’t mine, either, until a few months ago. All I could think of, sadly, daily, were the things I’d lost. The ways I’d changed. The wrinkly crinkly face I was growing. The strange sudden urge to throw ice cubes down my top every so often. The inability to walk twenty yards without dripping in sweat. And, yes, those things still happen. I’m still wrinkly, crinkly and, often, incredibly hot (and not in a good way). But, you know what? There’s so much else to be getting on with. So many dreadful and wonderful things have happened in my life already: the dreadful things – well, no matter how dreadful, they’re rarely forever. And as for the wonderful things, it’s your choice to acknowledge them or not. A wonderful thing (as I said in another post, once) can be watching the wind on a stinging nettle, because so many wonderful things had to happen for you to be watching that wind and that nettle: the gift of sight (and it is a gift), the gift of freedom, liberty, aloneness (yes, they’re all gifts too), alertness. Aliveness. 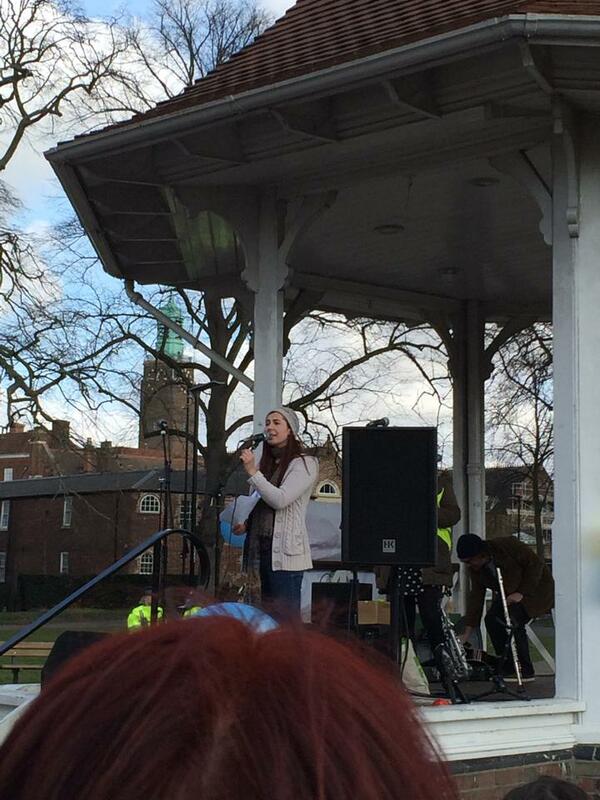 I did a bit of rabble rousing yesterday, at a rally to save our local school from academisation. Photo by ace photographer Lucy White. 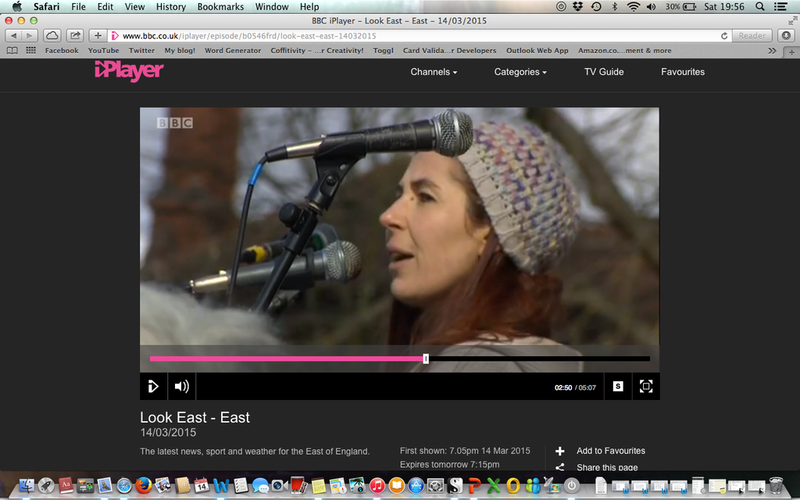 I even, briefly (and silently) made the local news. Angry and be-hatted of Norfolk. When I was younger, I wouldn’t have done that. I wouldn’t have bothered, and I wouldn’t have felt confident enough. I was too busy heaving myself up the hill (with a pushchair, to boot). There are lots, and lots, and lots of women in the Norfolk flatlands over that hill who have things to say and do and share. I never particularly thought I was worth it, to quote L’Oreal, because (a) upbringing (we’re kind of mousy in my family) and (b) what if I make an arse of myself? But so what. It’s no biggie, making an arse of yourself. You always feel better the day after doing something, trying something, than the day after running away from it all. So, don’t run away, my fellow hill climbers. You already ran up a hill (or crawled, or plodded): the scenery’s lovely, the tea’s hot, the biscuits are chocolate. There’s no going back, and it’s foolish to try. You can no more be 20 again than 11, or 8, or 4… Now is now. You are you. I’ll raise my fancy flask to that. ← Alzheimer’s, and other embuggerances. I’ve never had a problem with my age (probably because I always felt like I was about 18, whether I was physically 10 or a couple of decades older!). But my husband used to consider himself still quite hip and with it, until a young niece of mine (18-19 at the time) came to visit and muttered something about middle-aged men trying desperately to pretend they are young and hip with their sports cars. Just as my husband’s friend came to pick him up in his Porsche 911. I still laugh about it when I remember his face! Writer, lecturer, inactive activist. Mostly I blog about writing, education, and mental health. Photograph courtesy of Erin Patel. Re-search: because you didn’t find it the first time. Back to square seven or possibly eight (with apologies for radio silence). Your blog contains a number of factual inaccuracies. An unspun truth is a frightening thing. Ever feel like you're starring in your own one-woman farce? Writer of books some people have read and a TV show nobody's seen.